The most successful rotary engine is the Wankel engine. Developed by the German engineer Felix Wankel in 1956, it has a disk that looks like a triangle with bulging sides rotating inside a cylinder shaped like a figure eight with a thick waist. Intake and exhaust are through ports in the flat sides of the cylinder. The spaces between the sides of the disk and the walls of the cylinder form combustion pockets. During a single rotation of the disk each pocket alternately grows smaller, then larger, because of the contoured outline of the cylinder. This provides for compression and expansion. The engine runs on a four-stroke cycle. The Wankel engine has 48% fewer parts and about a third the bulk and weight of a reciprocating engine. Its main advantage is that advanced pollution control devices are easier to design for it than for the conventional piston engine. Another advantage is that higher engine speeds are made possible by rotating instead of reciprocating motion, but this advantage is partially offset by the lack of torque at low speeds, leading to greater fuel consumption. In most engines a single cycle of operation (intake, compression, power, and exhaust) takes place over four strokes of a piston, made in two engine revolutions. When an engine has more than one cylinder the cycles are evenly staggered for smooth operation, but each cylinder will go through a full cycle in any two engine revolutions. When the piston is at the top of the cylinder at the beginning of the intake stroke, the intake valve opens and the descending piston draws in the air-fuel mixture. At the bottom of the stroke the intake valve closes and the piston starts upward on the compression stroke, during which it squeezes the air-fuel mixture into a small space at the top of the cylinder. The ratio of the volume of the cylinder when the piston is at the bottom to the volume when the piston is at the top is called the compression ratio. The higher the compression ratio, the more powerful the engine and the higher its efficiency. However, in order to accommodate air pollution control devices, manufacturers have had to lower compression ratios. Just before the piston reaches the top again, the spark plug fires, igniting the air-fuel mixture (alternatively, the heat of compression ignites the mixture). The mixture on burning becomes a hot, expanding gas forcing the piston down on its power stroke. Burning should be smooth and controlled. Faster, uncontrolled burning sometimes occurs when hot spots in the cylinder preignite the mixture; these explosions are called engine knock and cause loss of power. As the piston reaches the bottom, the exhaust valve opens, allowing the piston to force the combustion products—mainly carbon dioxide, carbon monoxide, nitrogen oxides, and unburned hydrocarbons—out of the cylinder during the upward exhaust stroke. The two-stroke engine is simpler mechanically than the four-stroke engine. The two-stroke engine delivers one power stroke every two strokes instead of one every four; thus it develops more power with the same displacement, or can be lighter and yet deliver the same power. For this reason it is used in lawn mowers, chain saws, small automobiles, motorcycles, and outboard marine engines. However, there are several disadvantages that restrict its use. Since there are twice as many power strokes during the operation of a two-stroke engine as there are during the operation of a four-stroke engine, the engine tends to heat up more, and thus is likely to have a shorter life. Also, in the two-stroke engine lubricating oil must be mixed with the fuel. This causes a very high level of hydrocarbons in its exhaust, unless the fuel-air mixture is computer calculated to maximize combustion. 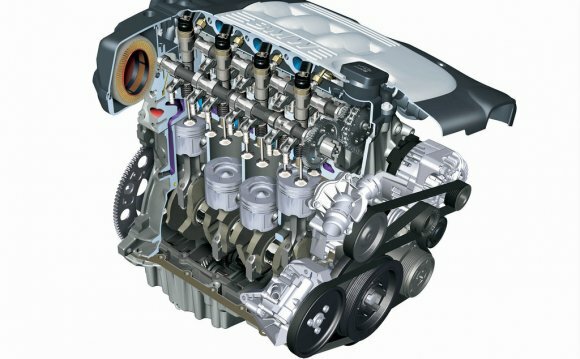 A highly efficient, pollution-free two-stroke automobile engine is currently being developed by Orbital Engineering, under arrangements with all the U.S. auto makers. Most small two-stroke engines are air-cooled. Air flows over cooling fins around the outside of the cylinder and head, either by the natural motion of the vehicle or from a fan. Many aircraft four-stroke engines are also air-cooled; larger engines have the cylinders arranged radially so that all cylinders are directly in the airstream. Most four-stroke engines, however, are water-cooled. A water jacket encloses the cylinders; a water pump forces water through the jacket, where it draws heat from the engine. Next, the water flows into a radiator where the heat is given off to the air; it then moves back into the jacket to repeat the cycle. During warm-up a thermostatic valve keeps water from passing to the radiator until optimum operating temperatures are attained. Four-stroke engines are lubricated by oil from a separate oil reservoir, either in the crankcase, which is a pan attached to the underside of the engine, or in an external tank. In an automobile engine a gear pump delivers the oil at low pressure to the bearings. Some bearings may depend on oil splashed from the bottom of the crankcase by the turning crankshaft. In a two-stroke engine the lubricating oil is mixed with the fuel. In order to meet U.S. government restrictions on exhaust emissions, automobile manufacturers have had to make various modifications in the operation of their engines. For example, to reduce the emission of nitrogen oxides, one modification involves sending a certain proportion of the exhaust gases back into the air-gasoline mixture going into the engine. This cuts peak temperatures during combustion, lessening the amount of nitrogen oxides produced. In the stratified charge piston engine two separate air-fuel mixtures are injected into the engine. A small, rich mixture that is easily ignited is used to ignite an exceptionally lean mixture that drives the piston. This results in much more efficient burning of the gasoline, further reducing emissions. Another device, the catalytic converter, is connected to the exhaust pipe; exhaust gases travel over bars or pellets coated with certain metals that promote chemical reactions, reducing nitrogen oxide and burning hydrocarbons and carbon monoxide. For many years engine knock (rapid uncontrolled burning that sometimes occurs when hot spots in the cylinder preignite the mixture causing loss of power) was fought through the introduction of lead into gasoline. However, concern over air pollution and lead's destructive effect on catalytic converters forced its removal. The state of California, with the worst air pollution in the United States, has instituted a series of measures designed to reduce automobile emissions; these include special gasolines, different air-gas mixtures, and higher compression ratios. All cars, trucks, and gasolines sold in California must comply with these regulations.